For example, you might want to increase all your prices by 10%, or you might want to change all your Hide values from Yes to No, or you might want to add $2.00 to all your product prices within a single category, or you might want to add a given set of products to a category (or remove them from a category), or you might want to strip-out all instances of "Special Offer" from your product descriptions, or you might want to correct typos changing all instances of "komputer" to "computer" in your product names. First you define the criteria that you want to use to find the products that you want to change, then you choose what you want to update, then choose/enter the type of change that you want to make. It also allows you to do a test run so that you can see your potential changes before they get applied so that you can double-check your settings before you apply the change. You just turned 100's of hours of work into minutes..... it just so saves the man hours required to maintain a big site. Use powerful SQL statements to perform more complex updates. Decrease price by 10% for all stock items with more than 10 in stock. Add products to a category. Add all products that are priced under $10 to your "Special Offers" category if you're running a sale. Remove products from a category. Take all your products that are between $5 and $10 out of your "Special Offers" category (if you're running a new sale of lower values than before). Strip out text strings. Delete the words "special offer" from all your product descriptions. 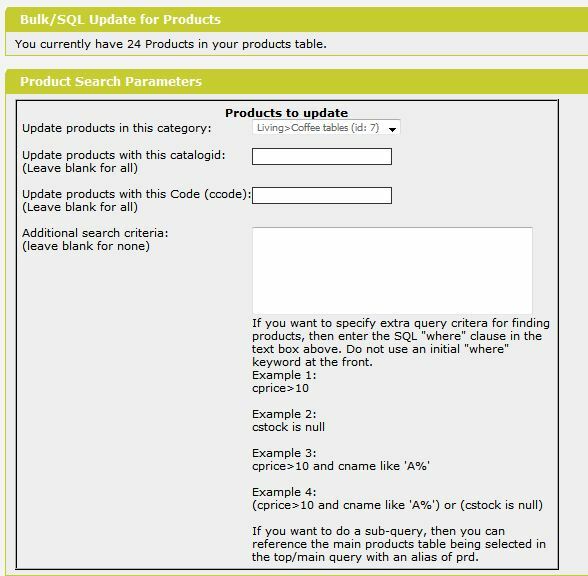 The sql "Replace" function isn't available to Access databases via ADO (web based programs), and also can't work on SQLServer text/ntext (memo) fields, and similar logic applies to MySQL; so we've created a function that you can use in BYZ089 to do case-sensitive (or case-insensitive) replaces on any product field on any database. This means that you can now strip out text values, or swap text values, within your fields via BYZ089. 02 04-FEB-2006 Checked and tweaked files and documentation to be fully compatible with VP-ASP V6 and added notes/help on the Replace function problem with some Access Jet Engines. 03 29-JUL-2006 Added new styles/titles for the submission buttons to more easily tell the difference between test run and live run. 05 13-JUL-2008 Changed to automatically detect the existence of version-specific category columns (the byz_bku_config_vpaspversion config option is no longer used/in-place). Restructured to simplify category tree logic and to help minimise memory usage. Altered to cater for sql/ado text/ntext (memo) bugs. General visual enhancements made to screen. Changed stylesheet to be included within the screen itself so that it doesnt need to be applied to the general admin header files. 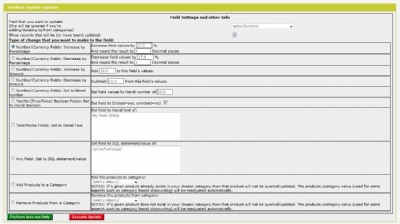 Added extra options so that you can add/remove products to/from a given category in bulk. 07 28-DEC-2010 Added BYZSQLREPLACE functionality so that you can use Replace logic to swap/strip-out text strings (standard SQL Replace functions are not available for Access databases on ADO, or for SQLServer Text (memo) columns etc, so this extra functionality has been added so that you can replicate what a SQL Replace function does even though its not available/possible to do it via SQL/ADO; the BYZSQLREPLACE function also has a case-sensitive/insensitive option). Added more data types and logic to the check when finding out the datatype of columns and when retrieving their values from cursors into arrays. Split-out vpasp-version-specific differences into separate files so that the core logic can be common where possible (to allow for easier maintenance of the addon). 08 17-FEB-2011 Added extra encoding logic to cater for special characters better (html characters and other special characters) in the fields, data, and output. 09 01-SEP-2011 Added more logic to help avoid cursors being blanked out due to sqlserver/vpasp bugs. Added flushing commands to avoid buffer overflow errors when a large number of products are being displayed. 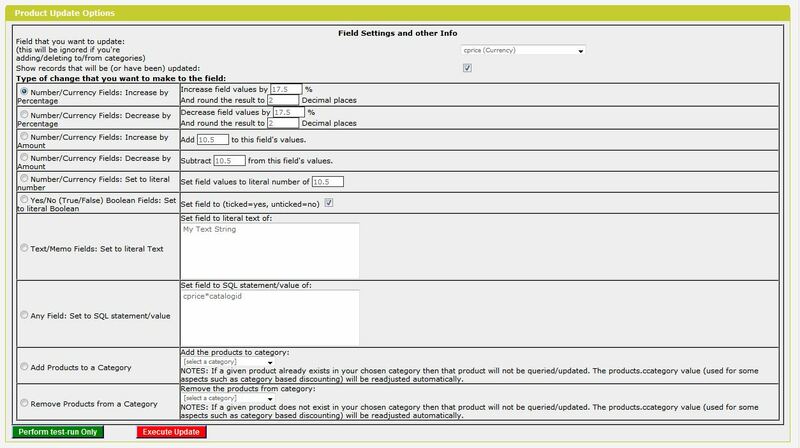 Added extra parameter to be able to restrict the number of products displayed on the results section. Applied some minor html corrections/changes. Please Note: You must be using V14 or later of BYZ038 before upgrading to V09 or later of BYZ089. BYZ089 V09 or later will not work with V13 or below of BYZ038. 10 06-JAN-2014 Enhancements made to deal with European-style decimals (ie with commas instead of periods). Boolean column logic fixed for access databases. Changed to use BYZ038 tools/functions where appropriate. Added version checks to documentation files. Please Note: You must be using V28 or later of BYZ038 before upgrading to V10 or later of BYZ089. BYZ089 V10 or later will not work with V27 or below of BYZ038. Changed the category-tree logic to avoid problems with too many nested cursors. Cleaned up the html in the screen.